From 11 June 2018 Google Maps will be greyed out and covered with a watermark for certain users of the Google Maps APIs (Google Maps Platform). This indicates that the code for the application, solution or website concerned does not include an ‘API key’. This is easily fixed, and we are happy to help. Do the test in three simple steps! Add the Google Maps Platform – API checker to your Chrome browser. 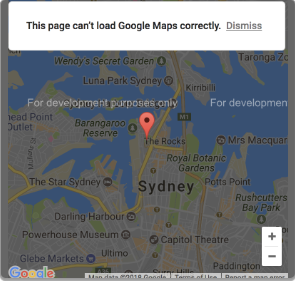 Go to the website where you are using the Google Maps Platform. Is the location pin green? Then you are using the Google Maps Platform correctly. Is the location pin red? Then you are not using an API key, so you will have to create an API key. How you can do this is explained below. Are you a Localyse customer? Then contact us so we can provide step-by-step assistance and explain the best way to create an API key in your specific situation. We can help you gain insight into the changes, the impact they have on your solution and the estimated use and explain how to calculate any costs. Because you are a customer of Localyse – your Google Cloud Premier Partner – we can look into whether you are eligible for a special volume discount. You can easily create API keys yourself on the Google Console. To provide you with the best possible service, it is important that we know whether the Google Maps integration results in conversions or not. After all, you may be loading a Google Map on the homepage that is not particularly relevant, yet your website may have many visitors. If you have a website with many visitors/conversions, you will most likely have to validate your credit card before you can use the Google Maps Platform. Would you like to avoid having to register a credit card or investigate how the use can be reduced? We can help you with this as well as provide insight into the estimated use, the impact this may have on your solution, activate invoicing (without credit card) and calculate any costs and special discounts. Interested? Then be sure to contact one of our Business Developers. Would you like to know more about the Google Maps Platform? Then check out our site concerning the Google Maps Platform where you will find everything you need to know about features, licensing model and pricing.